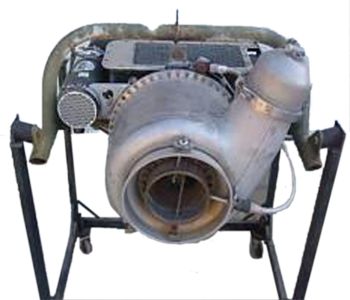 The Runnable Auxiliary Power Trainer Model AE-21 is a combination of an operational APU from a large airplane and computer based training (CBT). This combination not only provides hands-on training, but also reinforces the knowledge gained in classroom lectures. The APU is mounted on a mobile stand with all relevant controls and accessories that facilitate the operation of the APU. Layout: Single spool with reduction gearbox, output speed 6,000 rpm. 1st stage and 2nd stage single-entry impellers pressed and pinned on shaft supported in plain bearing at front and in ball bearing at rear. Radial diffuser.pressure ratio 3.3:1, and air mass flow 2.0lb. sec, at 40,800 rpm. Electro-pneumatic type. Automatic starting. Acceleration, load and speed controls. Pneumatic exhaust temperature limiter. Reverse air flow. 1 duplex fuel burner. AiResearch integral fuel system.Pump, 230 psi, governor, internal relief valve, and flow control. Bendix-Seintilla or G.L.A. ignition. 1igniter. Fixed area single exhaust outlet. Dry sump system, 90 psi air cooled oil cooler, tank. Reduction gearbox at front of unit. Output shaft 6,000 rpm.